I’ve been a huge fan of elephants all my life, probably dating back to watching The Jungle Book as a boy. Coming face-to-face with a massive bull on safari in South Africa only increased my respect for these majestic creatures. But, as anyone with an interest in wildlife conservation knows, elephants are becoming increasingly endangered, poached for their ivory in Africa and forced into back-breaking labor throughout Asia. Sangduen “Lek” Chailert, who was born in the remote mountain community of Baan Lao in Northern Thailand in 1962, is an elephant lover who decided to do something about it. 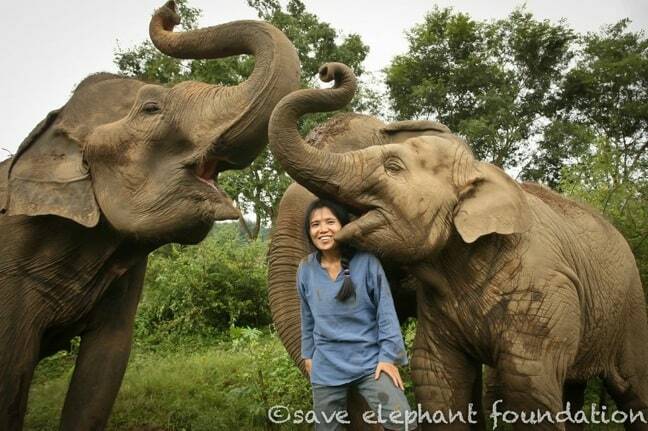 After graduating from Chiang Mai University, she opened the 250-acre Elephant Nature Park as a sanctuary for distressed elephants from all over Thailand. The park’s herd includes disabled, orphaned and blind elephants of all ages, many of which have been rescued from the abusive training involved in the logging, tourism and street begging industries. We became interested in her work with ENP and Save Elephant Foundation last year, when our friend Diana from D Travels ‘Round went to work at the park. 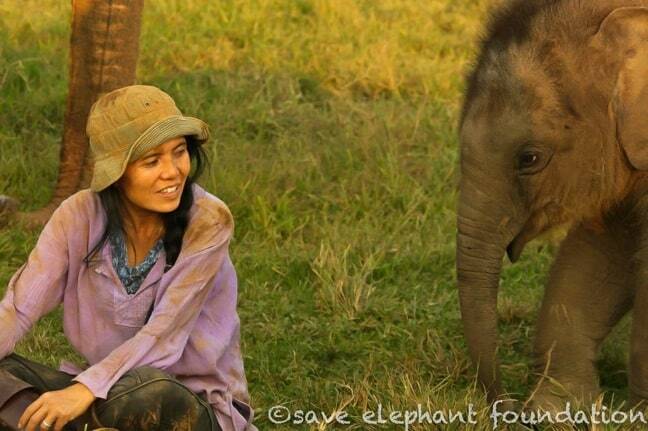 After seeing all of the amazing work Lek and her team of volunteers are doing to protect Asian elephants, a trip to Thailand quickly rose to the top of our 2013 Dream Trip List. 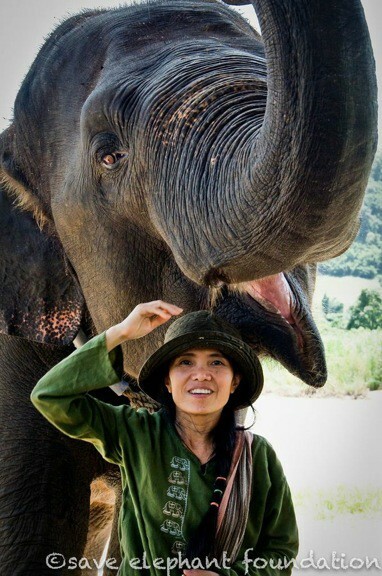 Though the trip is still in the planning stages for now, we were delighted to get a chance to talk to Lek about her life’s mission, why travelers shouldn’t ride elephants or pay for elephant paintings, and the challenges facing wildlife conservation in Asia. You grew up in the mountains of Northern Thailand, and I know your maternal grandfather taught you a lot about nature. What were some of the most important lessons you learned from him? My grandfather taught me to respect nature. It was the most important thing to him. He also taught me how to care for animals. Because he is a medicine man, he allowed me to respond to the animals when he rescued them. 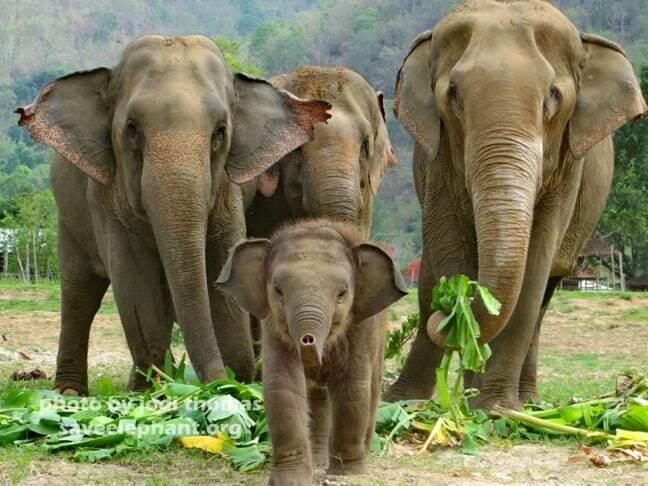 Your family cared for an elephant when you were just a child. Can you talk about that formative experience, and the connection you formed with the elephant? When I was young, I felt sorry and sad for the elephants. I loved them, but that wasn’t what motivated me to work for the animals. The thing that really changed my life was when I was 16 years old. I went to a logging camp and saw the elephants there, and I saw the abuse they received. That was something that changed my mind about animals and the way we live with them. What was your primary mission when you founded Elephant Nature Park in 1996? When I saw many of the elephants that were working in logging, the tourist industry, and street begging, I began to learn more about them. I learned that they could rest when they fall down, when they can no longer work. It became my mission to make Elephant Nature Park a home for the elephants where they would feel safe, where they can receive love and stay away from abuse. I wanted to use ENP to be an education center for elephant conservation. I wanted to spread the world to people that, whether they are traveling to Thailand or another country, they should respect the animals and not exploit them. A lot of people, even experienced travelers, don’t understand why it’s bad to ride elephants or pay for elephant paintings. Can you explain the training methods used, and how it impacts the animals? Elephants are born to be independent, and in the wild. It is not in their nature to work. Most people don’t investigate to find out what is behind what they see. The training the elephants endure is abusive, and they are forced to do tricks and paintings against their will. Most elephants are soaking with blood before they will submit. If an artist is painting something, they should paint with their heart, and not be forced to do it. I don’t understand why humans would collect something, when the owner of that piece of artwork doesn’t even agree to do it. Most Asian elephants, when they perform, have to pass through a lot of cruel training. The phajaan [i.e. torturing an elephant until its spirit is broken] is one example used widely in Thailand, but that’s only part of the problem. Elephants face this sort of treatment all over the world, from Hollywood to Burma, just with a different name. Phajaan is only well known because, in 2002, we exposed the cruelty in Thailand. But, there are many other words for it. 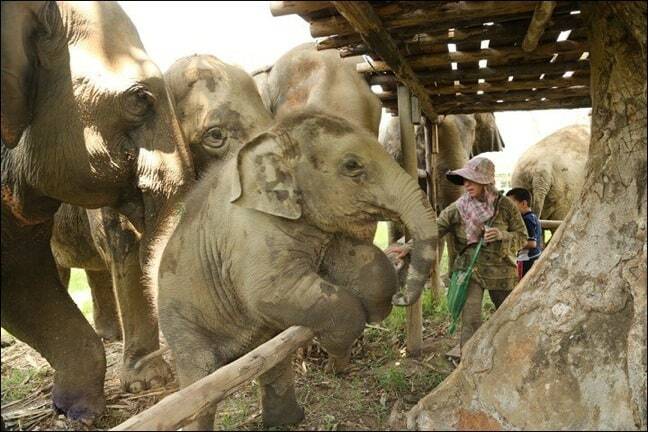 Visitors to Elephant Nature Park have an opportunity to volunteer there. Can you talk about the types of interaction your volunteers get to have with these animals? Volunteers are able to meet our herd and learn about what their lives were like before they came to the park. They bathe the elephants, feed them, and learn about the conditions of other elephants in the region. 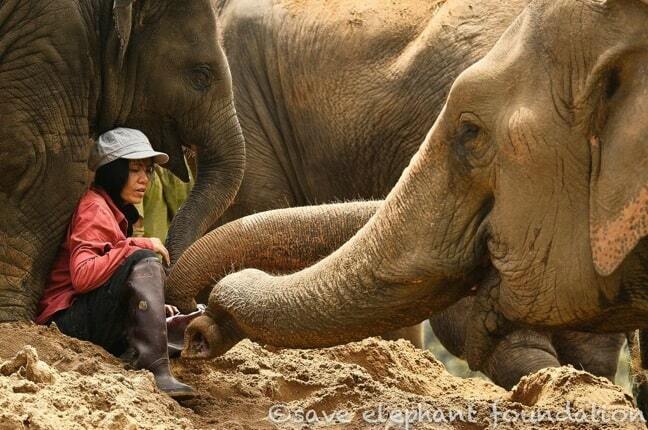 Volunteers at ENP are very important in the lives of our elephants. They help clean their shelters, prepare their food, plant their food, and make improvements to the park. We also have nearly 500 dogs we have rescued, and the volunteers can visit them, play with them, walk them, and even book a week or more to volunteer specifically with them. When you see animal lovers getting to interact with an elephant for the first time, how does that impact you on an emotional level? I have so much love for them. Being able to see people come to the park and fall in love with these animals makes my heart smile. Asia seems particularly resistant to wildlife conservation initiatives. Can you talk about the challenges of trying to change the way people view the relationship between mankind and animals? Most Asian people believe that animals and humans are at different levels [of importance]. This is the war between humans and animals. The only way to bring humans and animals closer together is education, spreading the word and speaking more on the side of animals. I know you were raided by the Department of National Parks several times last year. Has the situation improved since then? Yes, they have moved away from me. From Africa to Indonesia, it seems like elephants have never been more endangered. What gives you hope that conservation efforts like yours can help save the species? I still believe the world can change. People are becoming more educated. Animal rights people are standing up and raising their voices more, and spreading the word. Conservation groups are fighting harder, and speaking out more for the animals. I hope we can spread the word– the facts about these animals– and more people will begin to love and care for them. I still have hope that it isn’t too late to create peace for the animals. Even with ivory poaching and the illegal animal parts trade, we have a lot of positive movement at the moment. What can our readers who’d like to get involved do to help?